Yesterday, I ran into the husband of a friend of mine. The friend that I gave my breast pump to close to a year ago. He told me that we have to get together to catch up and let our kids play together. At the end of the conversation he said that he wants to return some the things that I gave his wife when she had the baby including the breast pump. She no longer needs it. Wow! That brought back many memories and emotions. 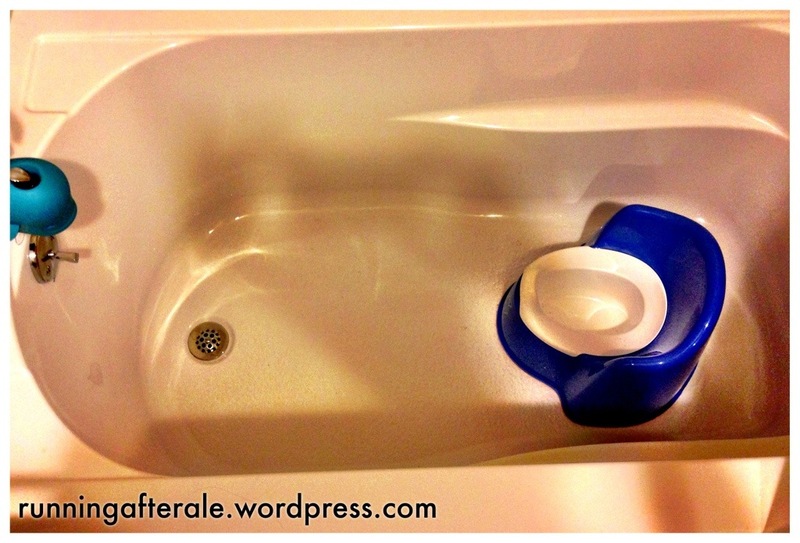 The lending of the breast pump to his wife sparked me to write the blog post Farewell My Breast Pump! Farewell!. I was also struck by the passing of time. Ale is a full fledged toddler and I have no desire to breastfeed him any longer. That’s for babies. We have new bridges to cross together. So I’ll take back the pump, but what will I do with it? Right now it will serve as a relic of the past. Farewell My Breast Pump! Farewell! 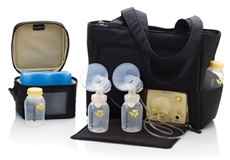 Yesterday, I lent my Medela Pump in Style to a friend of mine with a 3 month old baby girl who is returning to work. I lent it with great misgivings. I almost did not give it to her. My husband had to take it down from the cabinet and pack it for me. He reminded me that I was the one who offered it to her. “Yes, Linda you can borrow it! No problem! ” and that I had not breastfeed Ale in the last FIVE months. So why the misgivings? Watching that pump being wrapped up was like watching my first year with Ale flash in front of me. I swear I felt a letdown of milk! That pump- like it or not- was my symbol that I was a super breastfeeding mama who survived it all to give milk to my bebe for his first year of life. I pumped to build my supply. Then I was pumping to start a freezer stash. Then I pumped at work in any clean spot I could find. I doubled pumped, I single pumped, I fed Ale and then pumped. I PUMPED!! Coming home from work I proudly placed my 10-15oz of milk in the fridge and I indeed cried when the milk was spilt. Oh, I can hear the pump, pumping away now saying “Make milk, make milk, make milk”! Giving the pump to my friend, who promised to return it, also symbolizes the fact that Ale is growing so fast. When I stopped breastfeeding and transitioned to cows milk he would still come to the breast for comfort and get the few ounces that I was still making. Now he is coming less and less. He sees that mama no longer has milk then reaches out for his bottle. Its hard. I cried and cried the first night I made the decision to stop due to work restraints. Now I’m mourning the true end of breastfeeding. So now I’m passing my pump to my friend who no doubt will start to feel attached to the pump and in a years time will begrudgingly give it back to me. She will then sit down and blog about the end of breastfeeding and marvel at how much her baby has grown. In response to today’s NaBloPoMo at BlogHer. VOTE FOR ME on Top Mommy Blogs! Click on the banner below! Thank You! Vote For Me! I Just registered with Top Mommy Blogs! This is a new year and I hope to grow my little blog. This afternoon I took the plunge and registered my blog- Running After Ale- to Top Mommy Blogs. If you enjoy reading about my adventures with my sweet toddler Ale, vote for me by clicking on the TMB banner above. Each click that directs you to the Top Mommy Blogs website from my blog is a vote for me. So please vote once, twice, or three times today and come back tomorrow! I’ve given my blog website a facelift. Stop by and have a look around. Also, tell your blogging friends to come over as well and check out the new design. love to have people over. I would cook you dinner and serve drinks if I really could. Cheers! Tell us about a time when you didn’t bend to peer pressure, and you swam against the stream. Today’s prompt feels like an interview question. I can see myself sitting across from someone’s desk and I’m wearing a sensible skirt and black pumps. There are times in my life before I had Ale that I most certinly went against the stream. Isn’t that what your young adult life is all about? Breaking out against the grain, shattering molds. Finding yourself? Yes, there are times when I do feel pressured by other parents to do what they are doing but I feel that they are looking for validation for their own actions- especially new mom’s. (I am guilty of this as well!) I found this true with getting advice on helping my son to sleep through the night. I heard many, many theories and variations on theories on sleep that worked for their particular family. Remember the cry it out versus the co-sleeping camps? I was pressured and recruited by both groups. However, I just took pieces from each wise mom and found my own style. I don’t think this is going against the stream. Its just compromising and finding what is best while learning from your peers. Its January, so for moms of two year old children across my neighborhood in Brooklyn this means that the pre-school applications are due by the end of the month to snag a seat in September. I am so frustrated by the entire process and the cost that is attached to it in high application fees (up to $100 to apply for limited spots) that I am only planning to apply to three schools. Some moms on my block may tell me that I have lost my mind. The general consensus is to apply to around ten schools. This is to secure a seat in at least one and get on a wait list for others. This all sounds like Ale is applying for college. There are even pre-schools with early admissions processes!! Its insane. I fell into the peer pressure from other moms in my daycare to take our children out at three years old and send them off to a preschool by September. Its insane because at the end of the day all of the programs are play based with a bit more structure than Ale is getting now. I am continuously questioning if this is all worth it. I know for sure that I want Ale to attend a pre-K program to get ready for kindergarten but I wonder how important pre-school is for the “academic” growth of a three year old child. 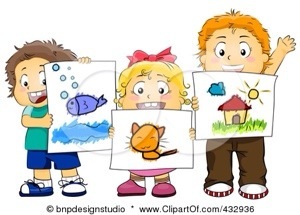 When I attend preschool open houses there are parents that ask a myriad of questions- regarding the school, how they will decipline their little angel, if the food that is served is organic, and how potty training is handled. If you’ve seen one fancy daycare you have seen them all. They all offer, Spanish, yoga, and organic hot dogs. I just want to know how much I have to pay a month and when are the drop off and pick up times. If the cost and the times do not follow our working parent schedules then I walk out the door. Simple as that. My fear is that since it looks like all of Ale’s friends will be leaving the current daycare in September he will be the big kid surrounded by 18 month olds. Perhaps I should succumb to the peer pressure simply because these are the “norms” here, and Ale has the potential to be left behind socially. Maybe our new Mayor Bill de Blasio will indeed institute universal pre-k in time for Ale when he is four years old if I just hold out a bit longer. Can I take that chance? Tell us about a time you bent to peer pressure. This past summer Ale showed signs of knowing when he did pee pee. Like the over excited mama that I am, I immediately went to Amazon.com and ordered a potty and a potty book. You know where this is going… It came and Ale was excited to see the potty and read the book. When it became time to actually sit on the potty without a diaper it was impossible. So I said no sweat, we can do this later on. The book then went on the shelf and the potty is stored in my bathtub (New York City living- no closet space for a potty!!). Now Ale is two years and two months old. I’m starting to get interrogated by mom’s who have potty trained their 19 month old daughters in a day. I could perhaps technically do it if I reserve a week’s time. Ale now grabs my hand to change him after poop. But, you know what? On this one I have to admit that I’m just too lazy to do it right now. That’s right- I can’t be bothered. Diapers are easy. I need something easy right now. I’m struggling with Ale eating well and sleeping (though last night he did sleep straight until 6:30am! whoo hoo!). That is more than enough. I know that Ale won’t be a teen in diapers so I’m not worried. This one I can drag out. So good for you smarty pants moms who know all and get everything done efficiently. I like having a potty in my bathtub. It makes a good conversation piece. What are you currently feeling pressure to do that you don’t particularly enjoy? 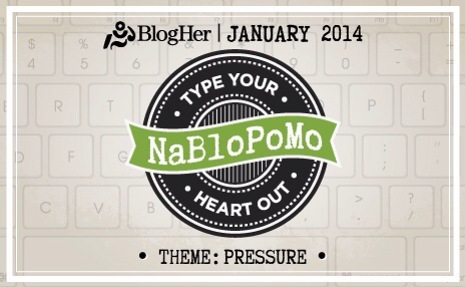 It’s a new year so I’m going to challenge my blogging self and (hopefully) take part daily in this month’s NaBloPoMo. Yay! Go me! On to the first installment! It’s 7am. Ale is awake and asking for Caillou and water. I’m looking at the clock and want more time in bed. Ale must be at the daycare at 8. The race begins. My heart is pounding. Getting ready in the morning under time restrains with a toddler is my high pressure moment and I don’t do well. At work as a nurse my patient can crash but this is when my “on”switch flips. I’m ready. I pull through calm and composed. In the morning on the way to daycare I’m riled up and sweating. It’s the rush. Did Ale eat enough? Why did he not eat his Cheerios? Should I forgo a shower? Ale, hold on. Mama is washing her hair. Great, now you are soaked. What will I put on? Where is my coffee? Ale, let’s change your diaper and get dressed. No. No more Dora. Let’s wash your hands. Ale, come let’s put on your shoes. Where are Ale’s socks? Ok here is your coat. Where is your hat? What’s that smell? Ale, did you poop? Let’s change your diaper again. Quick, get in the stroller! Wait, I left my phone in the kitchen. Oh, there’s my coffee. Ok, stroller and out the door we go! No, I don’t have your firetruck. Here we are! Go play with your friends. See you later!